[CONFCLOUD-46469] Unable to automatically add JIRA Software / JIRA Core / JIRA Service Desk - Create and track feature requests for Atlassian products. We're upgrading our cloud infrastructure to make your Atlassian experience even better. 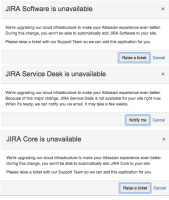 During this change, you won't be able to automatically add JIRA Software / JIRA Core / JIRA Service Desk to your site. Please raise a ticket with our Support Team so we can add this application for you.